Be Green Packaging is a leader and innovator in the design, manufacture and distribution of verified non-GMO, tree free and compostable packaging for the food and consumer packaging industries. This line of renewable fiber food service packaging is Cradle-to-Cradle Certified™. Be Green’s productions are forging an eco-conscious path towards sustainability. They continuously strive to manage a solid foundation of products that acknowledge their commitment to prosperous sustainability. Pulp products are made from annually renewable plant fibers and agricultural secondaries. The plants are pulped and molded into varying packaging shapes and sizes. Those processes are traditional but utilize 100% chemical free compositions. Be Green’s compostable products also meet the international standards of the ASTM D6868 for Compostability. Be Green is the first U.S. company to receive the Cradle to Cradle award. The DuPoint Diamond Award is the highest honor a company in this industry can receive for sustainable packaging innovation. Designed to be safe and durable, Be Green products are oven, freezer and microwave ready. Be Green manages an overall practical strategy that has served it well. 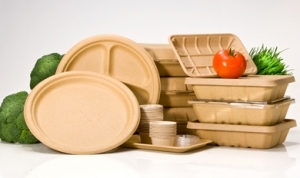 That’s to manufacture compostable products that address international waste concerns. As a for-profit company, the minds behind the products believe they need to play their part in minimizing overburdened landfills and to help control poor waste management. In that regard, the company is progressive and socially conscious in its development of alternatives to traditional packaging. They strive to create and implement initiatives that educate employees, stakeholders, suppliers and communities about the impact our actions have on the environment. Be Green wants to be a global leader in the production and distribution of green packaging, and THE promoter of getting every world citizen to do their part. The agenda includes food grade packaging made from renewable plant fibers and safe, eco-friendly productions. This is a commitment to responsibly manage a product’s life span, from materials to recycling water, reducing waste and returning fertile soil through composting. Providing thoughtful, transparent communication and high quality food service containers. Be Green has developed a work culture that ensures open and transparent policies permeate every aspect of production, reaching teams, partners, management vendors, etc. Seeking out the best technologies, raw materials, safe chemicals and green processes to enhance sustainability and evolutionary products. Whether it’s manufacturing, warehousing or end-user customers, Be Green provides education, entrepreneurial opportunity and leadership. Thinking beyond profits and sales, and donating time, energy and funds to the worldwide community to promote a positive impact on all environments. The line doesn’t stop at Be Green products and profits. Be Green is not merely committed to sustainable food service containers. To the world at large, they are also lauded for their annual philanthropic donations to a number of California environmental organizations. They also contribute to the Whole Planet Foundation. The latter is an international non-profit micro-finance company that supports women in developing countries. Be Green seeks a better way to do business and save the world. They efficiently incorporate economic, social and environmental responsibility into their practices. They feel the more you grow, they more progressive and socially conscious the organization has to be. Approaching production with sustainability in mind means better productions, better service and smarter business. The company reduces unused materials ending up in landfills. Recycled water and waste management minimizes polluting the oceans. Use of natural plant fibers greatly cuts down on the use of petroleum-based and forested raw materials. This is a company where core values are as important as it gets. Considering their code of conduct, one can see why BioMass Packaging is an advocate of Be Green and its compostable products. We investigate and research product development in operations that are making plates from plants and cups from sugar cane. Like Be Green, we want to make the world a better place, saving our ecosystems by reducing waste in commercial manufacturing.